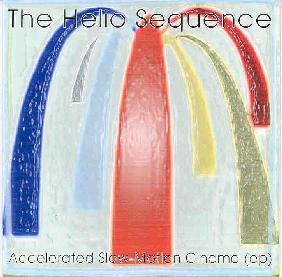 The Helio Sequence - "Accelerated Slow-Motion Cinema"
Denny Swofford at Cavity Search Records was pretty excited when he told me about this band and indeed it is a gem. The Helio Sequence is the Portland, OR duo of Brandon Summers on guitar and vocals and Benjamin Weikel on keyboards and drums. At only 19 and 22 years of age respectively these two have recorded a tantalizing quartet of spaced out pop tunes that bring to mind the most psychedelically creative moments of the Beatles and XTC. And when I say spaced out pop I mean serious spacerock within the context of mind expanding yet toe-tapping dancable tunes. The Beatles have got to be a big influence on these guys as the vocals are often Beatles-like and even sound a bit like John Lennon when they get really aggressive. I even heard a reference to "Lucy's lost diamonds" and "Transistor Radio" has a short "Here Comes The Sun" guitar bit. "Just Mary Jane (Calypso)" opens the disc with its melodic guitars and Beatles vocals, but also lots of bleeping space synths. There's simplicity on the one hand, but enough pace and tempo changes to give it an air of complexity. The guitars get quite crashing and aggressive in the last couple minutes for a pop spacey freakout. "106/Accelerated Slow-Motion Cinema" is my favorite track including gorgeous wah-wah and slide slipping guitars, and this is where the Beatles vocals get a little more specifically like John Lennon. Cosmic synth lines take the whole production more into orbit and at over 8 minutes the tune has plenty of room to stretch out. This is totally trippy stuff. Like Hawkwind's Space Ritual meets Sgt Pepper if you can imagine that. The song blends very smoothly into "Transistor Radio" and the two are really like one song. This is definitely the hit single of the four tracks and if this is the kind of stuff that can get on the radio, then there's hope for the FM dial yet. The final track, "The Birth", bring Helio Sequence into extra special psych freakout mode. Multiple synth lines and spacey guitar á la early Pink Floyd or Nektar create the intro to what is probably the most aggressive of the disc's four songs. People at work tend to raise eyebrows at the music I play but this one had them asking "who's that?!" And with only a bicycle for transportation, ACTION MAN found the means to attend both a Helio Sequence and a King Black Acid show in two locations on the same evening. Now you know you need to check this out. For more information contact The Helio Sequence c/o Beaverton Music Services; 12630 SW First Street; Beaverton, OR 97005.